One of the officers who was involved in the raid that left a married couple with no criminal record dead has been suspended amid a storm of controversy. Houston, TX — A botched drug raid last month shook the nation as a couple was killed by police in their own home and four officers shot. Now, after controversy and rumors have swarmed the case, more details are coming out that may paint an entirely different picture than what police have been telling the public. Adding to this suspicion is the news that this week, an officer involved in the raid has been relieved of duty amid questions about the warrant used to justify this raid containing false information. According to the Houston Chronicle, it’s not clear what role the officer played in the Jan. 28 bust at 7815 Harding, but law enforcement sources said his suspension comes amid a probe into questions over whether the sworn affidavit used to justify the no-knock warrant may have contained false information. The department has been tight-lipped about this tragedy since the beginning releasing very few details. Naturally, professional instigator and champion of the police state, Houston Police Officers’ Union President Joe Gamaldi is doubling down on his claims that officers did nothing wrong and attempted to relate the suspension to the officer’s injuries sustained during the raid. So many questions remain in regard to this tragic raid as this couple did not fit the profile of black tar heroin dealers. 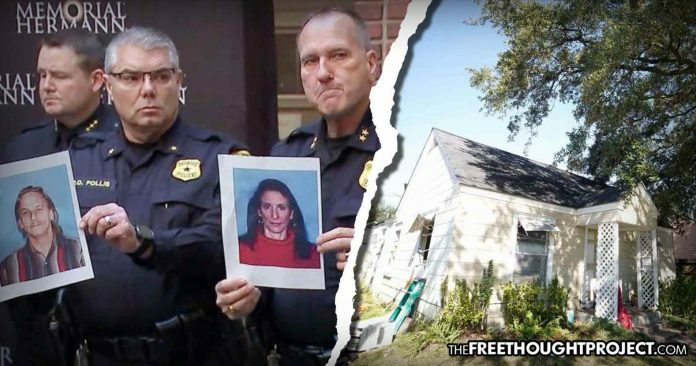 What’s more, the information allegedly given to police by the informant about what was in the house, was never confirmed after the couple was killed and their home searched. The informant also warned police of a “large quantity” of drugs inside, packaged in plastic baggies, and a 9mm handgun, according to the court filing. When presented on Jan. 28 with the police affidavit — written by an officer whose name was redacted in public records — a municipal court judge signed off on the warrant. Hours later, police crashed through the couple’s front door, sparking a gun battle that left Tuttle, Nicholas and their pitbull dog dead. In the process, five officers were wounded, including four who were shot. After the raid police found no 9mm handgun and no heroin. Another neighbor is confidant that the police will be exposed in this situation as well and is also outspoken about alleging that police were at the wrong house. Originally, the police attempted to paint this scenario like an open and shut case of a drug raid turned violent when the dealers fought back. But after looking closer, a different story emerges. As TFTP reported last week, something Art Acevedo did not say repeatedly at the press conferences is that the officers who entered the home were in plain clothes—not uniforms. What’s more, upon entering the house, they immediately began shooting as one officer killed the couple’s dog. That’s when Tuttle came out of the back room with his .357 handgun and opened fire. Robert Antu, who lived across the street from the couple—for the last 30 years—considered the couple dear friends. He told Click2Houston that Tuttle would have never fired on a police officer. Another neighbor, Esmerelda Becerra—who battled cancer alongside Nicholas—backs up Antu’s statements and said this loving couple would have never hurt anyone. “I still can’t stop crying!!! And yes they where (sic) GOOD PEOPLE!! !” wrote one woman who knew them on Facebook. According to Tuttle’s sister, Tuttle was also a disabled veteran. Nicholas-Tuttle was also a big time supporter of police, who liked the All Lives Matter page on Facebook as well as her local law enforcement—definitely not the typical habit of a black tar heroin dealer. While it is entirely possible that this couple was dealing heroin, there is an equally likely alternative scenario that could’ve unfolded like this: police acted on bad information from an unreliable informant—which happens all the time—and then raided the home. When the couple saw four plainclothes officers in their home—who immediately came in and shot their dog—they likely went into fight or flight mode. Tuttle opened fire, likely thinking he was the subject of a home invasion and Nicholas may have tried to disarm one of the intruders who she thought was trying to kill her. She was right. In this couple’s case, the “investigation” of their deaths is now being conducted by the very people who killed them. There is likely no chance of police flipping the narrative and revealing they were in the wrong. What’s more, because these undercover cops were in plainclothes, there is no body camera footage to tell what actually happened. And, since both of the suspects are now dead, they cannot refute the official story.